Historian and folklorist, Dr Fiona-Jane Brown shares historical gems and stories from Aberdeen's past (and present). The Silver City deserves to be celebrated! A new tale for the Blood & Granite II Tour, which features the crimes and punishments of medieval and Victorian Aberdeen. The Laird of Leith-Hall near Rhynie, Aberdeenshire, John Leith was enjoying himself after been in town to pay his bills at the Martinmas term, but his journey home again would be his last. The ballad featuring the murder of this landowner was collected by folklorist, Peter Buchan in 1829 for his collection of British folk song, "from a respectable tradesman's wife who recollects the circumstance". So what happened to Leith-Hall? Lairds, like farmers were often known by the name of their estate, as was the murderer, James Abernethy of Mayen who shot the fatal pistol ball into John Leith's head outside on the Plainstanes of Aberdeen's Castlegate. 21 December, 1763. Our protagonists were men in their thirties with young families, you'd think they knew better? It was clearly a case of the good Scots phrase "Fan drink's in, wit's oot!" John Leith, the third of that name was married to Harriet Stuart; his sons, John and Alexander were 6 and 5 at the time of their father's death, their brother James was still in his mother's pregnant belly. Mayen, also a family man to James, Jane, Isobel, Helen and Anne was married to Jane Duff. His mother was part of the Moirs of Stoneywood in Dyce, a venerable family. His uncle was equally distinguished as the heir of the Byres of Coates family in Edinburgh. Patrick Byres, though born in Ireland, had inherited his Scots cousins' estate in the early eighteenth century. He was married to the sister of James Abernethy's mother, Jean. It would seem that Patrick played a greater part in the drama than the balladier knew; that would come out at the abortive murder trial of May 1764. Byres was a 50-year old Jacobite who had fought for Bonnie Prince Charlie at Culloden and escaped to France to avoid arrest. He was able to return and avoid his estate being forfeited by taking advantage of the English authorities. His friends said, no, no, this is Peter Byres, he's not a Jacobite, you've got him wrong. Using the English form of his name, Patrick snuck back to Edinburgh and thence to Aberdeenshire to rejoin his wife and family. On the night of the murder, he was one of the "four and twenty gentlemen" that the balladier tells us was "birling at the wine." Archibald Campbell was the licencee of the New Inn at the time where the quarrel broke out between Leith-Hall and Mayen. This tavern had been founded in 1755 by local freemasons who felt a replacement was needed for Skipper Scott's tavern which had stood in what was now Peacock's Close. Patrick Byres was a boy of two back in Dublin, when this other old Jacobite, Alexander Scott had invited the exiled Prince James to dine with him during the Fifteen Rebellion. But though the Leiths and Abernethys may have supported that cause, Mayen's loud mouth ensured that petty jealousy would destroy any future relationship between the families. Joseph Robertson, author of the first Book of Bon Accord, a history of Aberdeen, states that the reason for the quarrel had been forgotten in the stir following, as does the ballad, but the folk of Leith Hall state that Mayen had accused Leith-Hall of adulterating the grain sold from his barns, providing a cheaper product for the same money. Naturally John leapt to his own defence. Mayen stormed outside, and one of the men left in the inn warned Leith-Hall he had better take care for his own safety that night. In the Castlegate, the ballad tells us "Cruel Mayen followed him /And shot him through the brow/ He left him lying in his wounds/ the blood was gushing down". John Leith was found bleeding from a wound in his forehead by his servants and friends; he was transported home to Rhynie to a sorrowful reception by his wife and children according to the ballad. Mrs Leith would have been distraught knowing if John died, his six year old son would become a minority laird, causing uncertainty to the whole estate. Sadly he did not recover and reputedly died on Christmas Day. Patrick had induced his nephew to stick to his guns, literally! However, many years later, Patrick's grandson, Dr James Moir of Stoneywood, defended Byres' part in the affair. Yes he was there, Dr Moir agreed, but he had only secured horses for his wife's nephew to escape, and was not the real killer behind the hot-headed Mayen. The murder was a great scandal which went down in Aberdeen's criminal annals. Lord Auchinleck’s son, the famous biographer and friend of Dr Samuel Johnson, James Boswell visited the New Inn ten years later, and an old waiter remembered Alexander Boswell and regaled them with the tale. 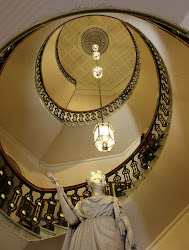 The pain of this earth-bound spirit, cut down in his prime lasted the centuries, even in 1965, Author Elizabeth Byrd who rented Leith Hall along with her husband John Gaunt during the 1960s, saw John’s ghost standing at the end of her bed. Just vengeance fall from Heaven's high/ And light on Mayen's head. The moral of the story is, don't go drinking with people who might actually wish you bodily harm! Patrice - Hairdresser to the Stars! This is the play I wrote - my first publication ever - I encourage people to get a copy on Amazon or Kindle! Share book reviews and ratings with Fiona-Jane, and even join a book club on Goodreads. COPYRIGHT FJ BROWN - DO NOT STEAL FROM THIS PAGE!!. Travel theme. Powered by Blogger.